Note: I receive accommodation in exchange for an honest review. I only choose places that seem awesome to me, and I only say a place is great if it truly is. A large archway, made out of the world’s biggest cross-cut saw, stretches over the entrance to Son Ranch. There are a scattering of buildings beyond the gate. The cozy cottage where my friend Carlie and I will be staying for the next two nights is lit in a warm orange glow. Nestled within a working forest on the outskirts of Grand Forks, B.C., Son Ranch offers an escape from the “real world.” The property is shielded from cell phone service, wifi and satellite, allowing guests the opportunity to unwind and recuperate without the intrusion of technology. The small-scale, family-run forestry operation welcomes friends, families and couples to their beautiful cabin, called the Bunkhouse. The Bunkhouse could easily sleep a family of four. Carlie and I took full advantage of our stay by cooking in the kitchen, watching cable television and relaxing with our feet up after a long day of exploring around the Boundary. The Bunkhouse is equipped with all the expected amenities—and then some. We were provided soap, body lotion and more towels than we could ever use . There were spices, flour and baking supplies in the kitchen cupboards. Our host, Janice, even brought us fresh cream for our coffee. 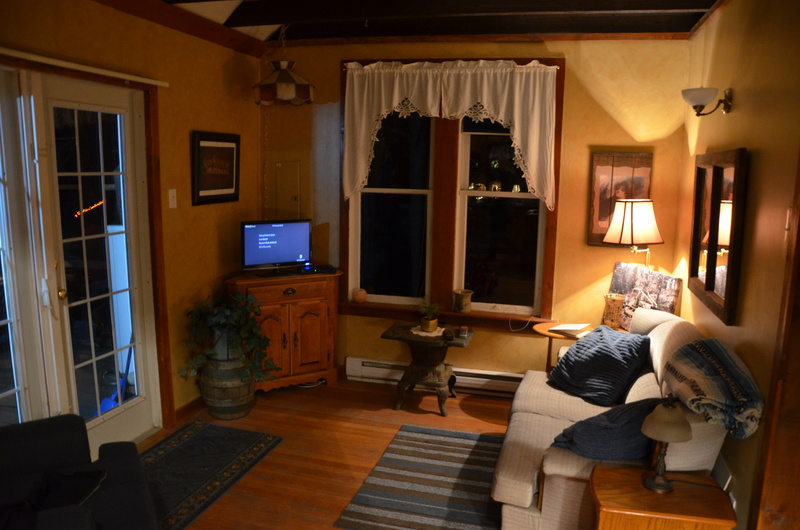 The cabin has two levels. There are two single beds in the upstairs loft with a tricky (but super cool) ladder to get up there. The loft is an open unit with no doors. The beds upstairs are a bit stiff, but overall quite comfortable. 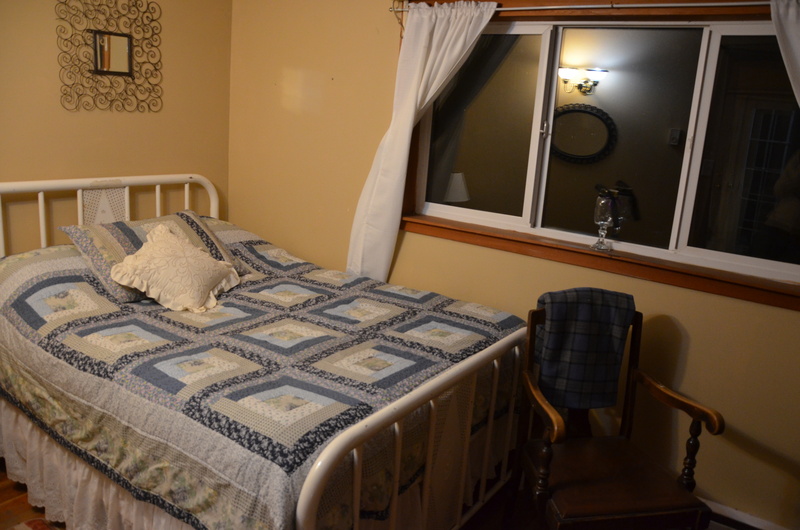 The double bed downstairs is much softer, but it’s not the largest—if you’re planning to share, be prepared to snuggle! There is only one door inside the entire cabin, which closes off the bathroom from the kitchen. Between the bedroom and the living room, and the entrance from the bathroom to the bedroom, there are curtains for privacy. 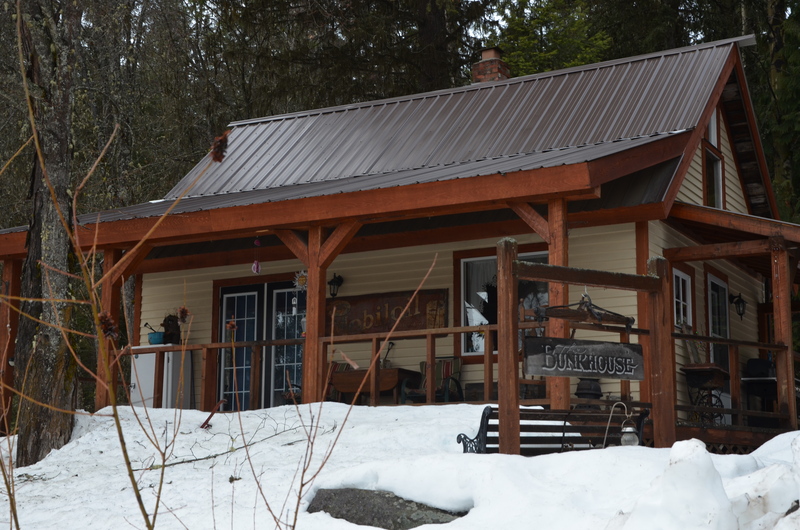 The Bunkhouse is fully equipped with heating, electricity and water. The three-piece bathroom includes a stand-up shower. However, guests will have to be okay with sharing the space with a few ants and spiders—this is, after all, a country cottage in a working forest. Son Ranch provides the local community with wood products such as custom timber frames and plywood. The working mill focuses on selection logging, custom milling and kiln drying. 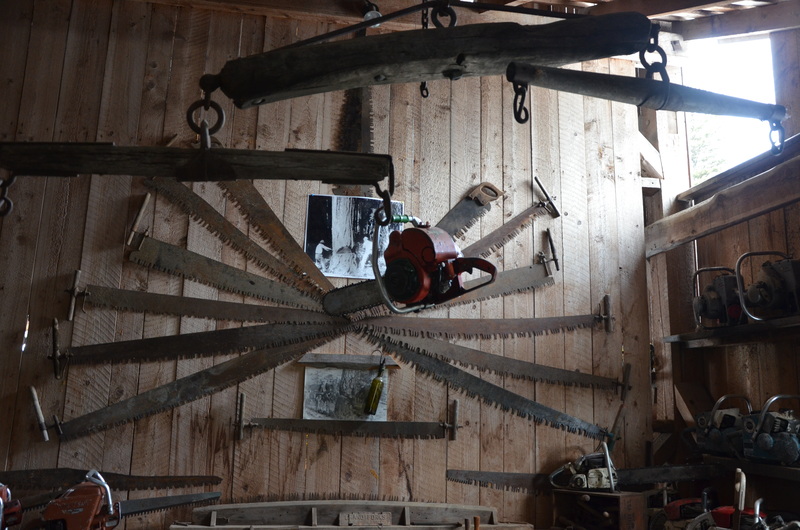 Just across the road from the Bunkhouse is the Chainsaw Museum. 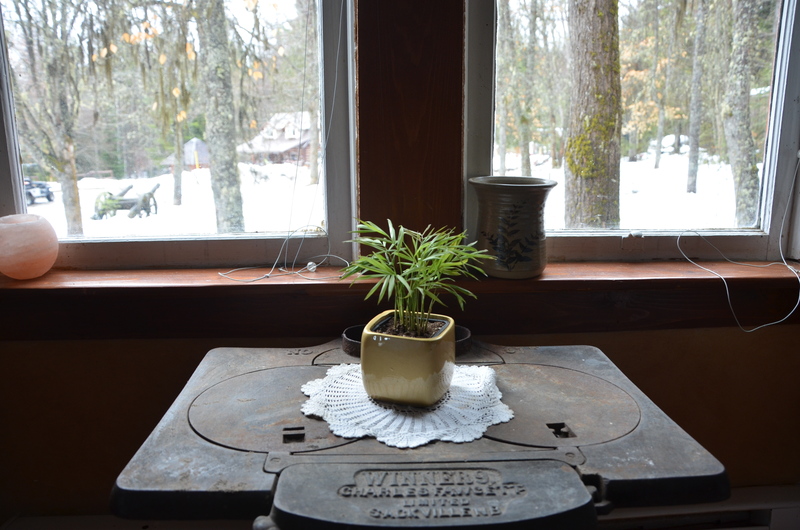 Janice’s husband, Ross, has been collective old logging paraphernalia for over two decades. Logging enthusiasts are drawn off Highway 3 to view the vast selection and shocking number of antique equipment. Even Janice doesn’t know exactly how many chainsaws they have; it would’ve taken me the better part of the afternoon to count. Although Carlie and I stayed at Son Ranch in the late winter, the grounds are most stunning during summer. Janice is an avid gardener; she takes pride in keeping the place blooming. There are countless walking trails spread across the property to wander in good weather. The estate is shared with horses and a young, friendly dog that happily greets newcomers. The natural, tranquil location of Son Ranch can also be a hubbub of activity with the family going about their business, trucks coming in and logging work needing to be done. If you’d like to learn what it’s like to run a small-scale logging company, Janice would be happy to answer questions about the history and current realities of Son Ranch. It’s easy for me to recommend the Bunkhouse at Son Ranch as a unique accommodation option in the Boundary. Rather than blowing through the region or spending the night in a characterless hotel, take an extra day to cozy up in the Bunkhouse and experience all that the Boundary has to offer. Previous A Spring Roadtrip to the Boundary, B.C. 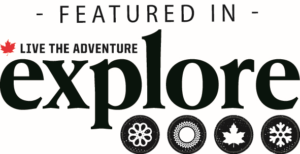 Next 5 of my Favourite Places in Kamloops, B.C.